When I wrote the article titled ‘ending Obasanjo’s era as constant catalyst in Nigeria’s political history’, little did I know that heavens was on my side and that the call resonate with the Nigerian electorates. Nigeria presidential election held on the 23rd of February, 2019 has been won and lost. The incumbent, President Muhammadu Buhari true to predictions and against all odds especially of the shenanigans of men like Obasanjo playing gods time and again with the political destiny of Nigeria, was returned elected. The election in retrospect can be described as one which resoundingly put an end to the era dominated by an ostensible oblate called Obasanjo and his ilk for the various infamous roles they’ve played in Nigeria democratic sojourn and its march towards nationhood. It also underscore once more that political contest is neither won on the pages of newspapers, Radio waves, and Television with all its glamour because they’re permeated largely by nonvoting angry mobs of enlightened yet biased Nigerians spewing person centric hateful rhetoric nor on social media because those who determine where victory pendulum swings come in insignificant number there at least in Nigeria where every election is local. Obasanjo and co had their chances and what did they do, nothing, at least to set the warped foundations straight in terms of democratic values, culture and building strong institutions! Instead, there were repeated rallying cries from the god in his pantheon at the Ota farm for a change of guard in Aso Rock Villa for various guilt he has laid on the incumbent President and it was often said his words will not returned to him empty. Indeed, experience and history has backed him that it would be another fait accompli after all he has been directly or indirectly involved in who becomes the President of Nigeria on a good number of occasions. His faithful also at some points alluded to the fact that his support for Buhari in 2015 was instrumental to his emergence as President. Now imagine if things had gone the way of his noisome permutations yet again, he would’ve been gloating in his gruffly voice that he has ensured the defeat of another of his many stubborn and ungrateful political god sons. And his status and ratings as a political demiurge would’ve hit the roof thereby increasing the number of people that will see him as somebody not to be toyed with. Perhaps this time, he has overreached on his luck-luster career as both a former military head of state and forth republic political trail blazer, a god-in-council with final say in the political life of the people. And we will not forget how he was handpicked by the power brokers to reap where another of his kinsmen has toiled till death on the front line of a hard fought political battle to re validate his stolen mandate. Riding on the back of flawed elections and meandering among deceptive alliances, broken oaths, official highhandedness and untrammelled individualism, his presidency unexpectedly came to an end with reported failed cravings for extension. But effectively all that larger than life influence has failed to have any meaningful bearing on the outcome of this election just concluded. The people have decided who they want by committing to Buhari because they believe he’s eminently qualified for the task of leading Nigeria from the rotten past of entrenched corruption and through the wilderness ahead into the new dawn of shared prosperity across board. Politics like sports generally is a game of numbers and the President was able to get the needed number. It doesn’t matter what the margin was. Recalled that the main opposition almost played to the gallery by questioning the numbers right at the collation center; there and then sending forth a protest letter purportedly from its national chairman Chief Uche Secondus to the Chief Returning Officer and not to the secretariat as require by law, to this effect. The duo of Festus Keyamo (SAN) who's the spokesman for the Buhari Campaign Organisation, and INEC chair however checkmated it. And to imagine this is the same numbers which had time and again sustained them in power while they held sway. The election itself might not rank where we ought to be but it’s equally not where we were before. To insist it’s a complete sham and so discountenanced is like saying the baby should be thrown away with the bathwater. Yes, there were pockets of violence and deaths as a result of premeditated plans by desperate politicians who will stop at nothing to comprise the system to have their time in office. This is simply because it’s not so much about service and other fantastic ideas warehoused in received democratic philosophy but essentially about political picnicking at the expense of the public. The card readers malfunctioned in some places. Some electorates were also disenfranchised reportedly by the electoral officials capriciously varying the application of relevant electoral rules and regulation. But in all, there’s no iota of doubt the incumbent won the election fair and square; and was duly returned. And anybody that’s not satisfied knows how to go about getting their redress. However, those wish to ride on the waves of interest and not evidence based reporting are having a field day and will see what they want to see. To this class of people, the election is free, fair and credible where their preferred candidates won but falls terribly short of standard where their preferred candidates didn’t. What a way not to be fair to the system! 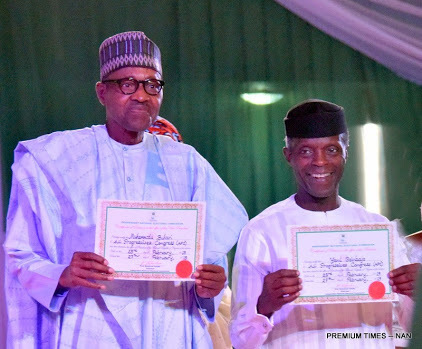 There’s another class of people so dissatisfied and disillusioned with the process owing either to the fact that their presidential candidate didn’t win eventually or were disenfranchised who have decided to shred their Permanent Voter Car (PVC) vowing never to participate in future elections like Obasanjo before them, whose excuse was his elevation to a non-partisan Statesman. Not so exemplary an action for the faceless bunch you might say; but we can forgive them for being naive and acting on childish impulse. Of the self-promoting elder statesman, are we to say he was a victim of old age or what? More so for renaging on his avow non-partisanship in this presidential election by supporting the main opposition candidate, Atiku Abubakar after their relationship went sore as President and vice President and appearing dead all this while to reconciliation with brusque finality. They’re angry to see supporters of the winning incumbent President in wild celebration and wish they should be stopped as if they don’t have a right to the expression of their emotions just like them who are going a-sorrowing provided they didn’t constitute or conduct themselves in manners that interfere with the smooth running of the various elements of the society. Going forward, there’s a genuine need for stakeholders in Nigerian democracy, like the Chief Returning Officer of the presidential election, Professor Mahmud Yakub reckoned earlier in one of his speeches immediately after the postponement of 16th February, 2019, to have a serious conversation on future elections in Nigeria. For all the flaws this election has thrown up, it's easy to fault the electoral umpire and to raise inquisition that it has acted in collusion with the government in power but failed to see the dangerous role political class has played. In the days to come, I foresee the realignment of progressive forces in the country just like Chief Obafemi Awolowo has predicted that when progressives take hold of the center there will be a gradual realignment of progressive elements. That said, I think the President needs to urgently act upon all he has said in the speeches accepting his declaration as winner of the election, and at the collation center where he was presented with the certificate of return by the INEC secretariat. Now is the time for the President to confidently and courageously shepherd Nigeria and Nigerians through into the foreground of greatness and plenty where nobody will be left behind. Nigeria definitely is no longer a country for the privilege few but for anybody and everybody who is ready to take their destiny in their own hands by constant self-development, repositioning themselves for opportunities and creating their own economies. Politician are used to deeping their hands into our commonwealth to build their economic empires; and the artisans and other professionals who are chanced to work on such estates have believed in error they’re being done a favor. With that no longer possible, they’ve resorted to foul cries and cheap blackmail through twisted narratives of the standard statutes of officialdom to have their way. Thank God it hasn’t worked and will never work. While there’s no government anywhere that’s completely good or bad; even in the advance society of West or East there’re still beggarly and never-do-well elements, and you might argue they come in dismissive number, so Nigerian youths must continue to align and realigning themselves with the positives and opportunities in the system wherever they find themselves.